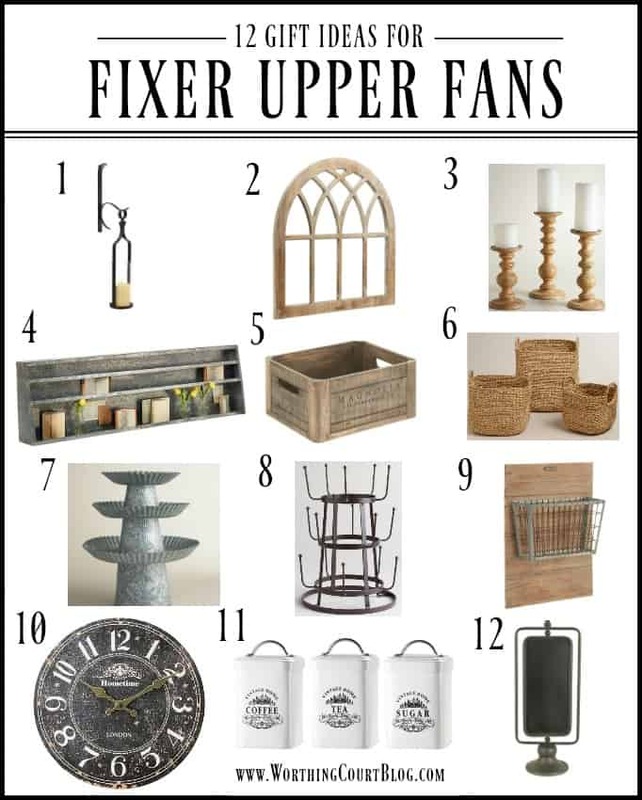 Anyone have a Fixer Upper or farmhouse style family member or friend that you need to buy a gift for? Are you stumped as to what to buy? Or maybe you want to gift yourself? I’ve done the shopping for you and have come up with twelve ideas. They’re in all price ranges! This list of 12 ideas is sure to please any lover of the farmhouse style that’s been made sooooo popular by the show, Fixer Upper! Just click on the name of the item that corresponds to the number on the image to be taken directly to it. And for anyone who happens to be wondering what they can get me for Christmas….well….here’s my list! 😀 Happy shopping, everyone! I could buy every one of these 12 ideas. Thank you for sharing and giving me ideas for Christ,as presents. Very nice!! I love a fair amount of these for myself. Wonderful ideas! I have newly weds in the family & these are wonderful ideas. I think those gift ideas would be perfect .. for ME!! Love. great ideas.I am impressed with your website and blogs. I love your ideas. You are as good of a designer as Hillary Farr. love the ideas esp. the mug holder. Thanks so much for the farmhouse style shopping info! LOL, Julie. I’d love one of everything! Thanks so much for the list of good Christmas gift suggestions. Thanks for the great ideas! 8 love fixer upper! I also love the pillows you have! LOVE that window! Hunting one right nown! Who knew that Nordstrom’s would have wall decor? News to me! Now I have one more reason to shop at my favorite store.T Thank you and Merry Christmas! Love your Blog! Great ideas and product suggestions….especially the affordable Christmas pillows. Merry Christmas to you and your family! Love the glam decorations, don’t think I’ve ran across gold garland or wreath but sure is pretty! Everyone keeps asking me what I want for Christmas. Maybe I should just forward this blog post! Too cute!! My son and his fiance are moving from Florida to live with us in St. Louis (only till they find a house). What great ideas for us to begin setting them up. there would be no complaints if i were to receive any or all of these! Great ideas! Thanks for doing all the hard work! I love anything by JoAnn Gaines. 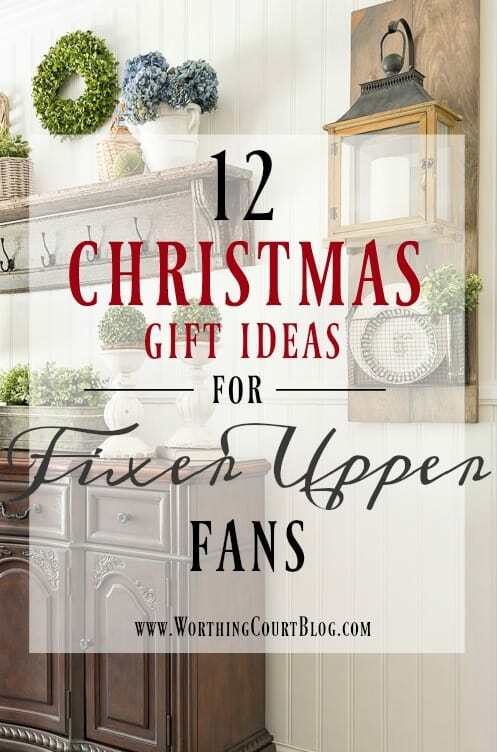 Fun gift ideas ~ I love the rustic farmhouse look! I just subscribed to your blog. I love it. It is has been my morning read with my coffee. Thanks for posting the article about the chairs under $100. It really helped me find some in my budget. Purchased! Merry X-mas to me! I really enjoy your blog…gives me such great ideas for my new home!! I always enjoy your decorating ideas! Love that window frame idea!! Am checking out the link right now. Thanks for the great ideas to put on my wishlist!